Member? I can be the President of AA group. For me allergic rhinitis is a biannual ritual, Feb March and AugSept, every year. Sniffling even as I type after reading this witty post. Ha ha, *quietly stands in the queue. Thanks Afshan 🙂 Yes, Montek is my savior now ! ha ha! nicely written! Keep Montek by your side at all times! You too? Oh boy! Lots more similarities. By the way, does Montek cause drowsiness ? Because what I take presently almost makes me hibernate for days! haha.. loved reading this. hope Montek helps you. Thanks Meera 🙂 Yes it is my savior ! When I first read your post about a week ago my nose was going off like a twin barrelled bazooka at the rate seven per minute. Yes, I know the malaise and my dreaded encounters with otorhinolaryngologists deserve nothing less than a full blown post or two. But returning to your explosive post and the call to join the anonymous society, I am amused at the power and proposition such a legion would have. I think of airport control towers and hotly contested lines of control along the Radcliffe and McMahon lines. I don’t sneeze or sniffle .. my allergies are related more to the food I eat.And I hate havign to give up so much of the yummy food while everyone around me hogs ! 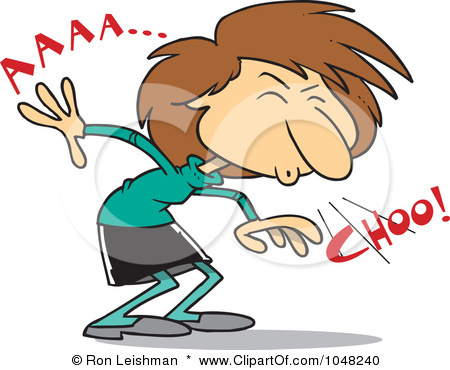 Oh…The “AAaachhhoooo” thing seems to be my most loyal friend visiting me whenever it finds a route.Don’t know how to deal with it as I HATE stuffy nose :(. Sorry, it’s all your fault, but I couldn’t stop giggling at your sniffling woes. Ha Ha. Why didn’t I think of writing on this topic before you? I should be the primary member of your club having tried everything from Homeopathy to various schools of Ayurveda to tonsillitis surgery with limited success. My wife tells me how lucky I was to narrowly miss being hitched to another of the tribe doubling the misery – one of her batch mates who had rejected me during my bride hunt process..
On a serious note though, hope something works out for you! My daughter had severe allergies due to change of weather. But then I taught her pranayam and she is almost cured. That’s great Indrani ! I also tried Pranayam, but didnt see immediate results. Will start it again. Ha ha ha….I could relate to this totally. You have a member at my place. The husband. His sneezing is so loud that we recently had to hospitalize him for pneumothorax. Thankfully, he has found relief too in Avamys Nasal Spray. My job these days is to keep the home absolutely dust-free. And trust me, it is a mammoth task with the Metro construction site just half a kilometer from our place. This was such a hilarious post!! Sorry to be laughing at your expense! I suffer from an allergy of a different kind, to hair color. I can tell you how crippling life can be if you are blessed with plenty of greys and nothing to combat them. Haha.We all have our own allergy stories, don’t we 🙂 glad that you liked the post. Welcome to my blog !